After the horrible events in the Clave-Fave meeting,  resulting in the death of Alec Lightwood's father, Robert, and Annabel Blackthorn's terrible actions on a member of her own blood-kin, Julian Blackthorn and Emma Carstairs take to their heels after the Lord of Shadows and Annabel, bent solely on her capture. Drusilla Blackthorn and Cristina Rosales have no idea where to find Jaime, but Drusilla's secret is something that will damn Livia, or revive her. Diego Rosales is white-hot, killing-rage, and icy, icy determination combined, and Zara and Horace Dearborn shall soon learn the consequence of making a Rosales dance in their farce of a tune. Tiberius Blackthorn and Christopher Herondale are now more determined then ever to take the Unseelie King down, by themselves,  if so necessary, and the Angel damn the Clave, the Consul, and whoever might dare to stop the Last Herondale, and the twin of Livia Blackthorn. Octavian Blackthorn is only seven. But he is a Blackthorn,  and Mark is more Blackthorn than Faerie than he has has cause to be. They are Shadowhunters. More importantly, they are Blackthorns, and Cristina, Diego, and Emma have love, loyalty, and life spent with them. And they have none to spare on the Clave, the Conclave, the Council, but just perhaps a shard,  for the Consul, mother of Helen Blackthorn's wife, and so Blackthorn loyalty extends to both Aline and Jia Penhallow. Sed lex, dura lex,  but now, Helen, Aline, Mark, Julian, Drusilla, Tiberius, and Octavian will follow their words, and Livia will not forget Malla Lex, Nulla Lex as their fight to stay together passes their own mortality, and surpasses any effort to lay them claim of the Clave. Love is stronger than Law, and the Blackthorn's will tear Heaven itself apart for their final peice, their missing soul. And Livia fights to remain, secure and solid in her love and her faith in her family. She is a Blackthorn. She will care none for a bad Law, and less of a good one, and will return. Juliana blaze is smart,brave,hard working,fast learner,and she's 16 also she had nightmares during her sleep about she being picked to the games. While training she struggles on some things but she gets some help by a carreer girl named Clove.When Juliana meets Cato the big strong 18 year old  carreer boy she started liking him.And Cato did the same.But will Juliana win the games? Tessa, Will, and Jem's generation is over. Now it is time for their children to take the spotlight. The ever delightful Matthew Fairchild. The dreamer Lucie Herondale. The bookworm James Herondale. And finally, the sassy Cordelia Carstairs. Follow these four characters-and a few others-as they go through many of the ups and downs, that life will bring them. This is the sequel to Cinderclary. I can't give a summary for this story because then I would give a huge spoiler for the first book ? So, go read Cinderclary, then come back and read this one ? In the third and final book of the TMI meets TID series, the New Yorkers decide to go back in time to London 1903. Only this time, they bring their children with them. What happens when they meet the shy James Herondale, the friendly Lucie Herondale, the always delightful Matthew Fairchild, and many more. Follow them, as they go through what may be the most memorable trip of their lives! The world fell two months ago. When the wars ended, everything was chaos. Nobody knew what to do, so nobody did anything. We were left to fend for ourselves. Then the Renegades came in and started The Hunt. From a distance, my blood can't be seen, my eyes are undistinguishable. From a distance, I'm normal, I'm safe. I use that distance to get away. All I can depend on is my mind. What if Henry made a portal that took the Shadowhunters from the London institute, to the New York one? 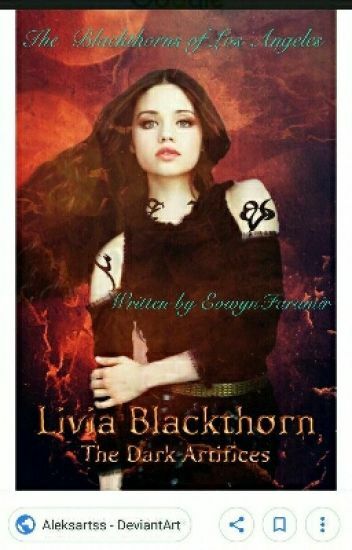 In this book The Mortal Instruments and The Infernal Devices meet. Find out what goes on when two worlds collide. The Londoners decide to go back to the future. Clary and Jace are getting married, and Tessa is pregnant. But there is trouble in paradise when Jace goes on a mission, and Cecily makes a big announcement. Find out what happens in TMI meets TID 2! When James Herondale, Matthew Fairchild, Cordelia Carstairs, Lucie Herondale and a few others, get whisked away in a portal, the last place they expect to be is Los Angeles, 2012. Having no place to go, they find themselves at the Los Angeles Institute, where they meet Emma Carstairs and all of the Blackthorns. What will happen when two very different worlds collide? J.K. Rowling wrote Harry Potter's story - biased against Draco Malfoy. And this story does not belong to J.K. Rowling, or Harry Potter, or Hogwarts, or even us. This story belongs to Draco Malfoy. Disclaimer:The general plotline and all characters do, however, belong to J.K .Rowling. "i hate to see them like this, i absolutely hate it"
livia blackthorn has woken up - but this time as a ghost and with only kit herondale as an intermediate between the silent city and the shadow world. - all characters belong to cassandra clare.